Please remember to keep in your prayers these "mamas" and also the papas, and all who have suffered unimaginable heartache at the hands of pure evil. "He healeth the broken in heart, and bindeth up their wounds. The Lord lifteth up the meek: he casteth the wicked down to the ground." Dear sweet mamas, I don’t know your pain. But this I know: your children did the right thing, and I pray your unimaginable grief is mixed with unbelievable joy that they chose Jesus. I know you are hurting today. I won’t pretend I know how badly. I am a mom of three and the thought of not having my kids with me here on this earth scares and pains me and makes me feel short of breath. That that is a reality for you today, I am so, so sorry. I am grieved for you. I have shed tears for you and my heart breaks. But I don’t feel what you feel. I have to ask God to feel that for you, because I know He does. I have to ask him when I pray for you, as I have been doing constantly over the last 20 hours, to wrap you in His arms and to breathe sweet words of comfort in your ears. He knows the pain of a murdered child. He knows the pain, as you do, of a child who was murdered for his faith. Yesterday a 26-year-old man whose name I won’t give more fame to walked up to your child and said “Are you a Christian?” and your child said “Yes”. Then he shot them in the head. He walked up to some other moms’ children and asked the same, and if they said “no” he still wounded them, but he let them live. He killed nine of your children, Mamas. Do you know what that means? That means eight of your brave children saw one of their own take a bullet in the head for claiming Christ and they said yes anyway. They said yes anyway. They said yes anyway. They said yes anyway. Yes. Yes. Yes. Yes. Yes. Yes. Yes. Yes. Yes. Nine lives gone from this earth. Nine loved ones immediately in the glorious presence of Christ. I want my children here with me, and I know you want yours with you too. But I will tell you that a YES and a life snuffed out for Christ is better than a NO and 100 years more on this earth without Him. To LIVE is Christ, and to DIE is gain, and your children PROVED that yesterday. May we all look to them and BE STRENGTHENED. Mamas, this is a dark time in our world for those who love the Lord. And in our country, it has been easy for a long, long time to claim Christ. But it is getting harder now, and it will get harder still. The truth is before long, it may very well be ME or MY CHILDREN having to choose Christ over life. If that moment comes for me, I will think of your children. 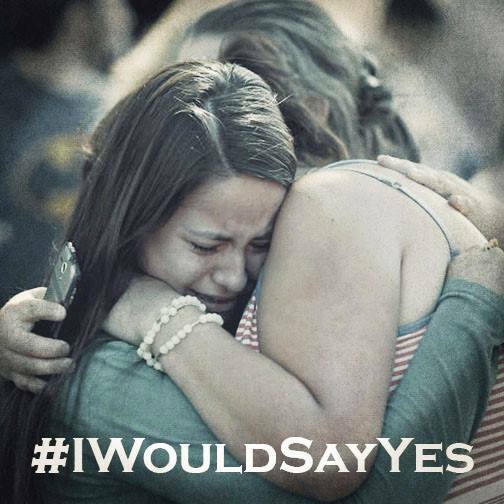 And I will have the strength to say YES. I pray and pray and pray that my young children, when they are 18, 21, 23 and in college like yours, will be strong enough to say YES also. Because ultimately, ALL I want my children to accomplish in life is a deep relationship with Christ. And your children’s actions yesterday have inspired me all the more to instill that love for Christ in my babies. Thank you for loving your children. Thank you for being Christ to your children. You have made a difference in a way I know you never wanted or hoped or expected to, I know, I know. But Mama. Your child was able to look into the face of God yesterday and hear “well done”. And I’m pretty sure you had a lot to do with that. Sweet Mamas, I am praying for you. It is my hope that my prayers and maybe these words when you are strong enough to read them will help you through this time when all you want is to hold your child again in your arms. Oh, Mamas. I hurt for you. And on behalf of Christian moms everywhere, let me say, we will NOT forget your children. Their lives were not in vain, nor were their deaths. I pray that God’s glory and love surrounds you. And I thank you, Mamas. For raising up children who said YES.